In-form jockey Ben Melham saddles a host of winning chances at Caulfield on Saturday, but none more promising than two-year-old juvenile Brooklyn Hustle. The Rosemont Stud filly returns to the races after an impressive win at Moonee Valley in December upon debut. She now steps up to Group 2 level in the Ladbrokes Blue Diamond Prelude (1100m) as the second-elect this weekend, and Melham admits he’s excited by the promising youngster’s potential. Jockey Ben Melham hopes to claim his first win in Saturday’s Blue Diamond Preludes after finishing 12th in 2016. 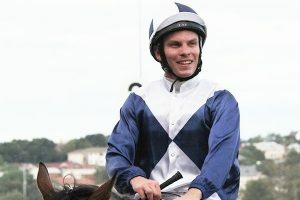 “She’s very exciting, I trialed her last week, sat on her this morning, gave her a nice gallop and she indicated she’s going very well” Melham told Racing.com. Installed as a $4.20 chance, the only question surrounding the Jason Warren trained hopeful is the barrier. Brooklyn Hustle will jump from gate 8 alongside $5.00 chance Athiri, but Melham feels patience might be the key to success. “I’d imagine she’d be in the second half of the field anyway, probably just go back until we get cover on her at this stage,” Melham said. There’s no denying Brooklyn Hustle’s first-up run at The Valley last year raised a few eyebrows. A dazzling turn of foot was on display as she raced from the back of the pack at the 550m mark to hit the gap and win by two-lengths. Not surprisingly, the sectionals also stood out. Brooklyn Hustle ran the fastest average speed of the race (61.8 KM/H), but most importantly clocked the best final 600m split of the entire day – 33.16 seconds. Full Blue Diamond Prelude Odds can be seen below.